Artist: Ted Eberle, Canada, 1955. First Nations: Pacific West Coast. 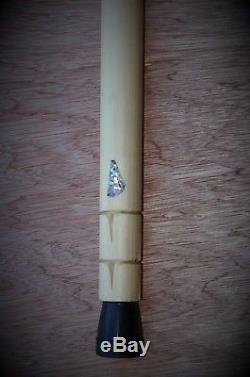 Artwork: Original, First Nations Hand Carved Sea Snake Walking Stick / Cane, as shown in photo. Decorated: Abalone shell (5) and copper (2) inlays, leather tie and rubber tipped. 43 height X 5.5 width, all in inches (width includes snake head / handle) (109 cm X 13.9 cm). A beautiful and masterfully designed artwork, Collectible and functional. Size may be approximate (1 inch = 2.54 cm). A photo as shown may vary from the actual for technical or other reasons. A listing title may be "as known as". A list price is as set by us and considered a fair value. A condition is as graded by us using reasonable industry standards. With an older artwork, condition may allow for minor aging. An original signature may be similar if more than one artwork is available. An artwork or edition may vary on or after publishing. A documentation or reference may require additional detail. A certificate, with specifications as known to us, may be available on request. A listing description is to the best of our knowledge. We reserve the right to correct an error. We specialize in artwork by Chagall, Picasso, Matisse, Dali, Miro, Calder, Klee, Braque, Buffet, Dufy, Giacometti, Leger, Derain, Fini, Marini, Lichtenstein, Warhol, Francis, Ting, Appel, Dine, Haring, Indiana, Johns, Kelly, Cocteau, Magritte, Jenkins, Vasarely, Zox, Friedlaender, Rosenquist, Neiman, Toulouse-Lautrec, Icart, Tarkay, Renoir, Degas, Cezanne, Durer and many more. We have an extensive collection of artworks and objets d' art. 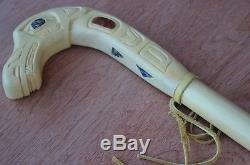 The item "Ted Eberle Original Hand Carved Sea Snake Walking Stick / Cane First Nations" is in sale since Thursday, September 27, 2018. This item is in the category "Art\Fine Art Prints". The seller is "artonfort" and is located in Victoria, BC. This item can be shipped worldwide.